Franky Saegerman started working at NATO in 1995 for the Office of Information and Press. As the Head of the Distribution Unit, over the years, he gradually shifted the external communication from a traditional paper based dissemination to a fully electronic dissemination and more recently also through social media. 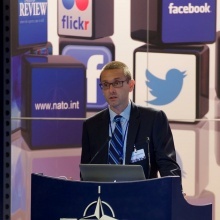 With the restructuring of NATO’s Public Diplomacy Division in Oct 2012 he was appointed Head of the Social Media Team and member of the Assessment Team. Over the last years he has put NATO on the Social Media map and looked for new and innovative ways to raise awareness for NATO through Social Media. In Jan 2016 he was designated Head Digital Insights and in his new role will provide strategic assessment, analysis and advice regarding the performance and impact of NATO’s Digital communications channels and products. He will focus on improving the impact of NATO’s digital channels/content, building greater audience understanding, identifying and pursuing opportunities for external recognition, participating in the coordination and organization of digital focused internal and external events and enhancing overall digital outreach through regular and as-needed performance reports and relevant analysis.